Some of these instructions are also found in the previous post. This post acts both as a summary of the basic 2/2 twill process and tips, and as a tutorial on changing directions; if you’re continuing straight from the previous post, you may want to skip down to CHANGING DIRECTION. Also, please check out my video series demonstrating the techniques described in these 2LW tutorials. 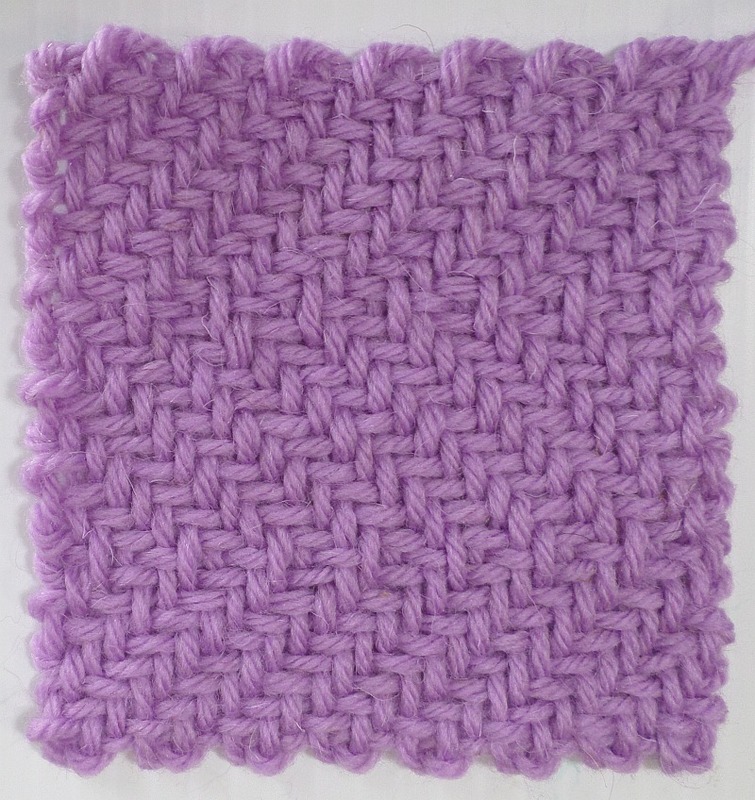 R1: Plain weave (P). Wrap Cr4 #4 pin. Insert needle in space. R2: (O2, U2) x 7, O2, U1. Exit between two pins at Cr3; wrap 2nd pin. R3: (O2, U2) x 7, O2, U1. Exit in the space; wrap pin #1. R4: O1, U1, (O2, U2) x 7, O1. Exit in the space; wrap pin #1. R5: (U2, O2) x 7, U2, O1. Exit between #2 and #3; wrap #3. R6: U1, O1, (U2, O2) x 7, U1. Exit between #2 and #3; wrap #3. Pin wrapping is as follows (from R3 on): wrap #1, skip #2, wrap #3. For Optional R32—there’s usually room for this row, so add it if you’d like, although I don’t recommend it if it will interfere with your pattern. 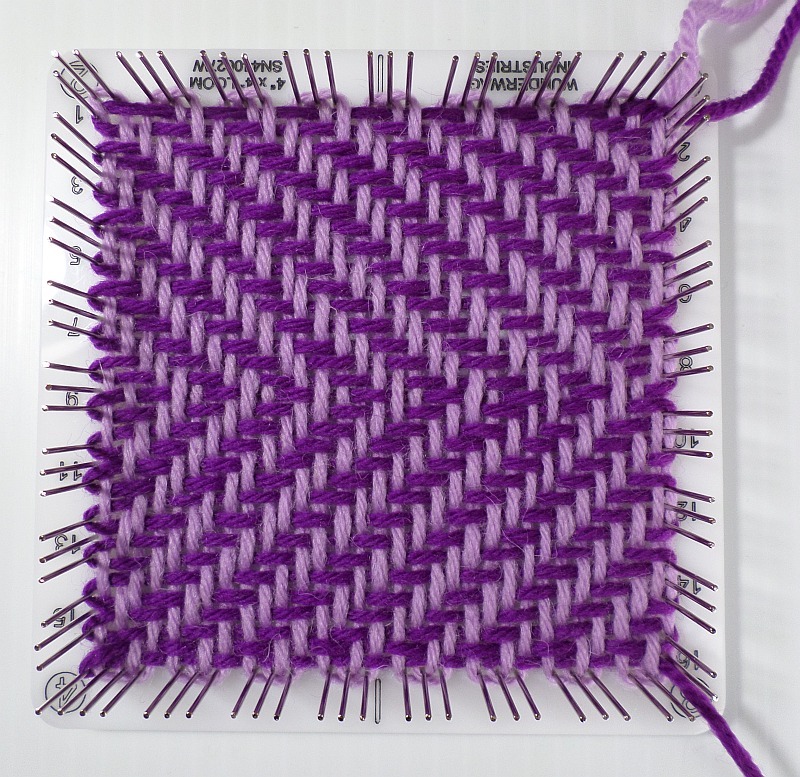 You can either continue the pattern or plain weave (you may need to take two stitches together to get it to work; it seems to work differently every time for me—I’m still experimenting with this row; see below, and previous post, for further information). UPDATE: I’ve found, with wool at least, if you warp a little more snugly there really is no need for that 32nd row. R32 is a fiddly row to work. Here it’s left a stray loop which can be taken care of when sewing the squares together—doesn’t look great on an individual square. 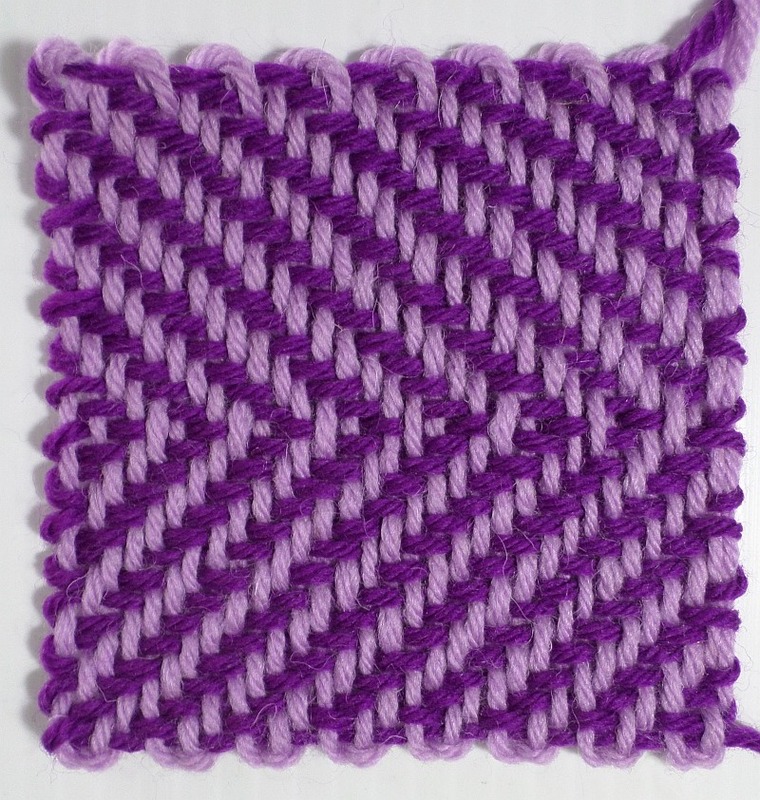 To switch directions after an odd row: repeat the row you just did (coming from the opposite side of the loom), e.g. if you just wove R5, weave R5 again. To switch directions after an even row: weave the other even row, e.g. if you just wove R4, now weave R6; if you just wove R6, now weave R4. Stay tuned for more 2LW weaving patterns!